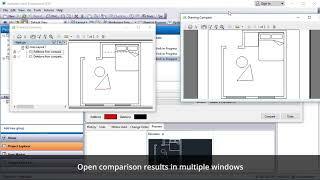 Drawing Compare for Autodesk® Vault® 2018 is a technology demonstration add-in designed for visual comparison of different drawings. It also enables users to check versions or revisions leveraging the attached dwf file to detect and highlight document changes. I'll ask it again...availability for VP2019? Hi Steve, thank you for your interest in Drawing Compare for Autodesk Vault. We are working on new version with support of Autodesk Vault 2019. Please send your contact information to support@amcbridge.com, so we could inform you when it is available on Autodesk App Store. Any idea on a Vault 2019 update timeframe? Hi Bryan, thank you for your interest in Drawing Compare for Autodesk Vault. Please send your contact information to support@amcbridge.com, so we could inform you when it is available on Autodesk App Store. When can we get the Toll for VAULT 2019? The tool is very grate. Hi Stephan, thank you for your interest in Drawing Compare for Autodesk Vault. Please send your contact information to support@amcbridge.com, so we could inform you when it is available on Autodesk App Store. Nice tool, but why you compare the dwf-files instead of comparing the Inventor.idw/dwg - files? There are not always all dwf-files of any version in the vault. Hi Norbert, , thank you for your interest in Drawing Compare for Autodesk Vault 2018. Your feedback is valuable for us. Current workflow allows comparing DWF files only. The ability to compare IDW/DWG files will be taken into consideration while planning future releases. Hi Julien, thank you for your interest in Drawing Compare for Autodesk Vault 2018. Your feedback is valuable for us. The described issue is known, it will be fixed in future releases.